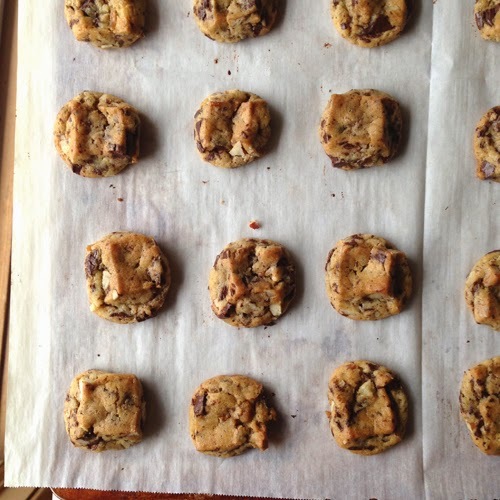 I've got several chocolate chip cookie recipes here on this blog--fifteen to be exact. This will make sixteen. 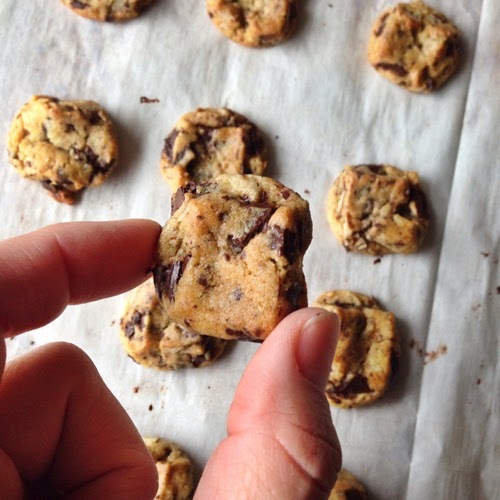 I was going to go for my current favorite, Crisp Mini Chocolate Chip Cookies Made Easy, but then I know that my husband prefers softer cookies. So instead of the Crisco, I put in 2 oz. cream cheese and baked them not quite as long. They've only been out of the oven for about 15 minutes, but they are soft, chewy, chocolatey, nutty, and fabulous. I still prefer the crisp ones, but I think I'll manage to eat more than my share of these. The beauty of these cookies is the way you form them. 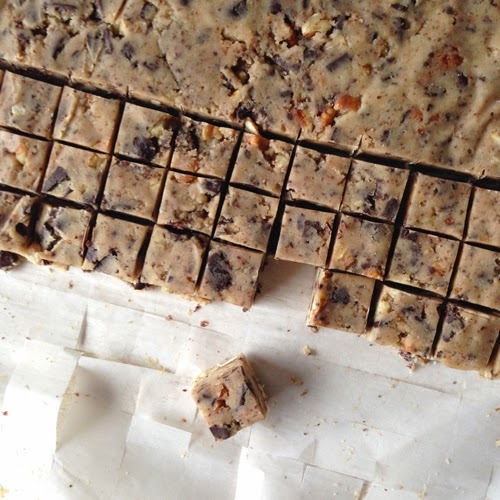 Smoosh the dough in the pan, refrigerate, cut into cubes, place cubes on pan and bake! Waaay easier than scooping dough. Plus, you can just bake a few at a time to make sure you have fresh cookies for like a week. I've toyed with the idea of freezing the cubes too, so I can just pop the cubes from the freezer onto the pan. 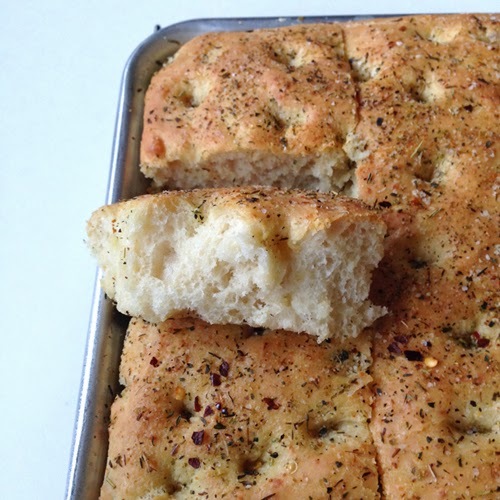 I might do that with my remaining dough, but for now, I just have the time to post this yummy recipe. 3. 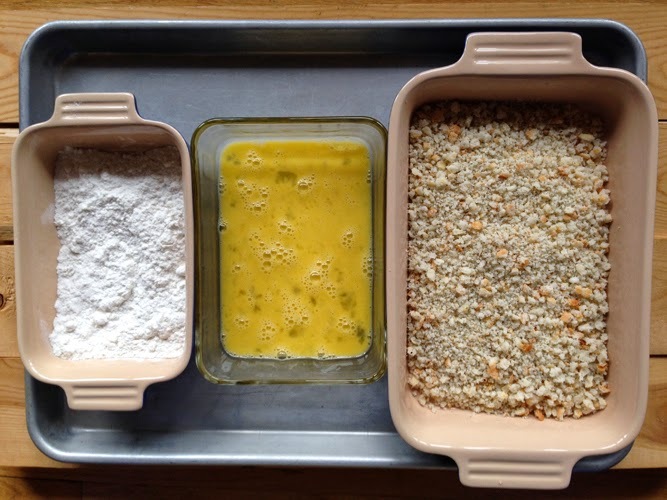 Combine moist mixture with dry mixture just until it comes together (do not over mix). Add the tablespoon of water at this point and mix until incorporated. Add the chocolate chunks and pecans. Line a 9 x 13 inch pan with parchment paper and press dough into the pan. 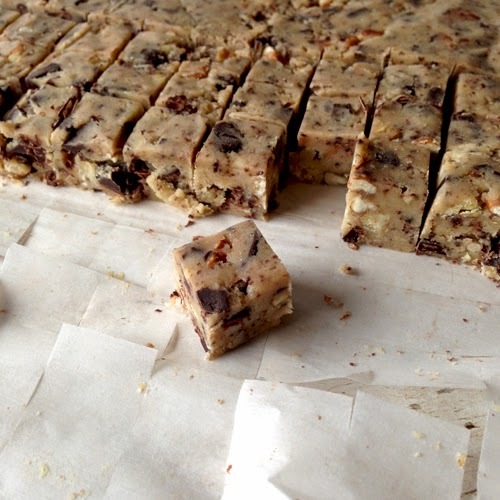 Place wax paper or plastic wrap directly onto the surface of the dough. 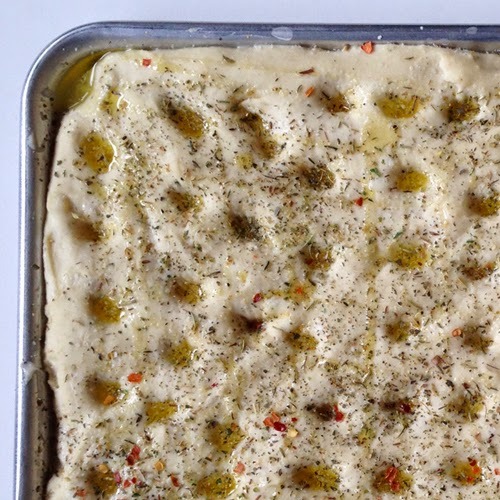 Refrigerate dough two hours or over night. 4. Preheat oven to 375°F. 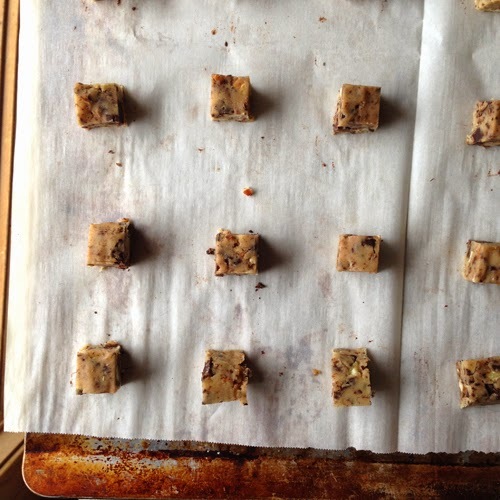 With a sharp knife, cut dough into approximately half-inch cubes and place cubes, 1 1/2 inches apart on a parchment lined cookie sheet. 5. 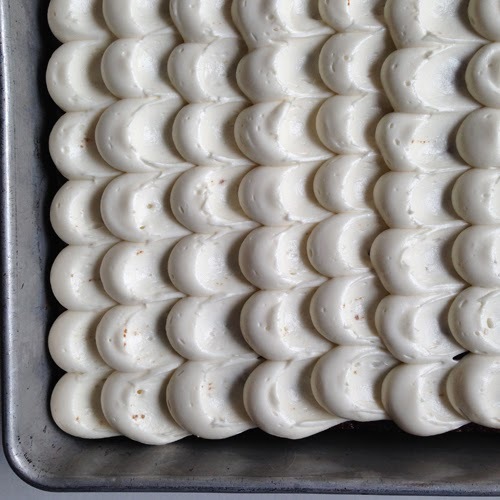 Bake 7-8 minutes, or until puffed and light brown around the edges. Makes about 13-14 dozen little cookies. 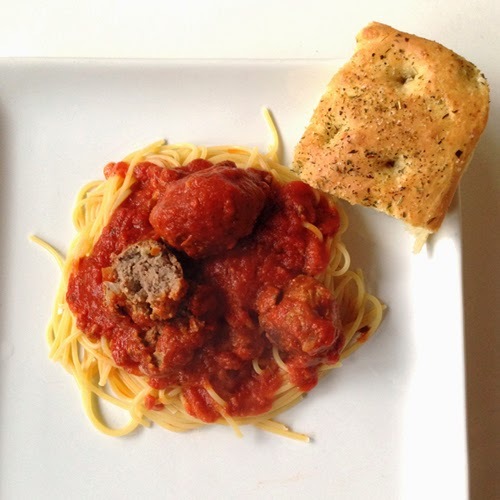 I served the meatballs over spaghetti noodles and with homemade focaccia. I have no idea why, but last night I decided to finally, at age 44, attempt to make homemade meatballs. I know. What took me so long? They're so easy, and so good. My 13 year old son ate too many, and the rest of us thoroughly enjoyed our reasonably sized servings. 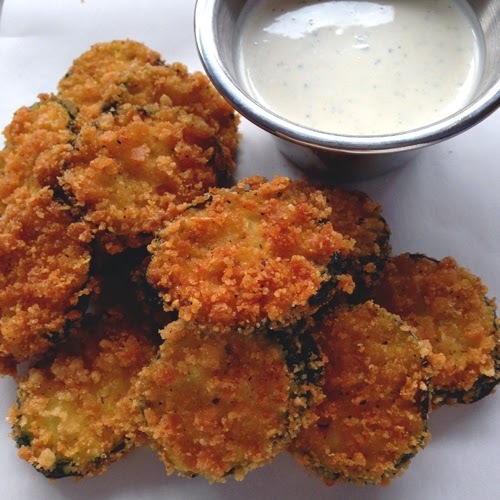 These are the perfect texture with the right balance of flavors and salt. Mmm. Perfect first attempt at meatballs. 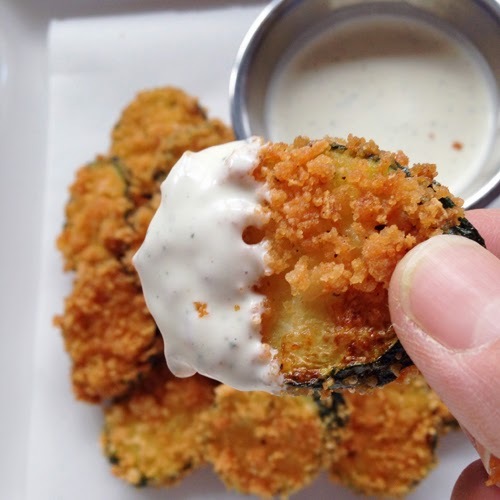 This recipe is definitely being put into my regular dinner rotation--that is, if I had one, it would go in--I will be making these again. The original recipe called for a pound of ground pork and a pound of ground beef, but I didn't want that many meatballs, and I only had ground beef, so that's what I used. At any rate, another success story courtesy of AllRecipes.com. Sorry, Chef John, if I messed with your beautiful recipe too much, but I couldn't have made this tasty meal without you. Oh, and I had no spaghetti sauce on hand, and I was not about to try making some from scratch, so I used what I had: pizza sauce and tomato sauce. It worked, and I'll be doing it again. In a medium sized bowl, soak the breadcrumbs and milk for about 10 minutes while you chop the onion and garlic. 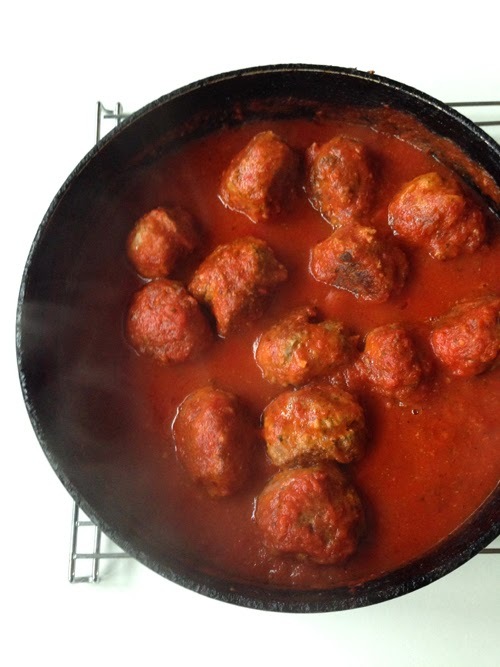 In a frying pan that you'll also use to fry the meatballs, heat the olive oil over medium-high heat. Saute onions until translucent, but not browned. Add the chopped garlic and stir for about one minute. Transfer onions and garlic to a small bowl to cool. 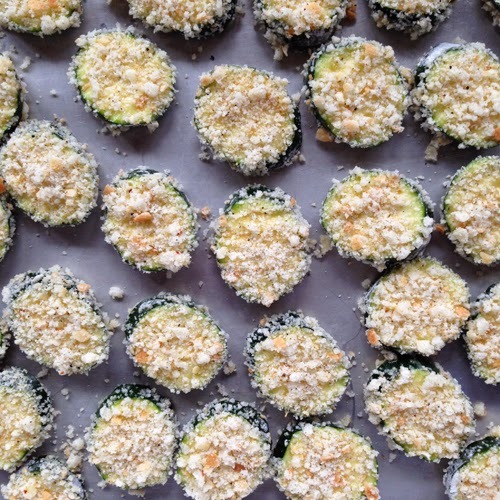 Into the milk and breadcrumbs, mix the egg, dried parsley, salt, pepper, red pepper flakes, Italian seasoning, and Parmesan cheese. Add the ground beef and cooled onions/garlic. Gently mix with your hand until completely mixed. 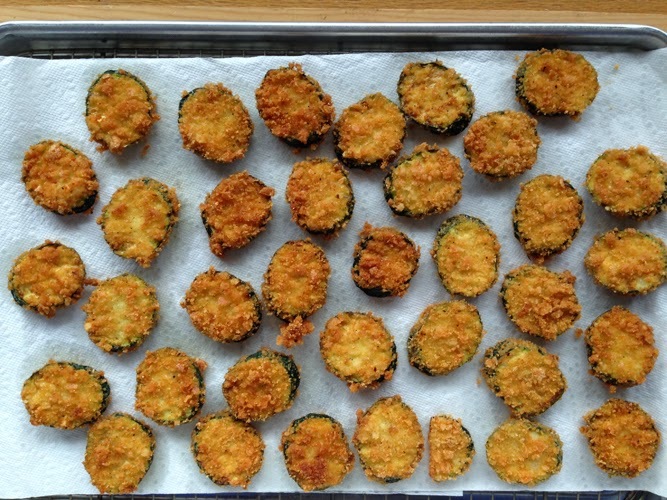 Cover and refrigerate for about 30-60 minutes. Wipe the pan out with a paper towel. Form the meat mixture into balls that are about the size of golf balls. Preheat pan over a medium heat. 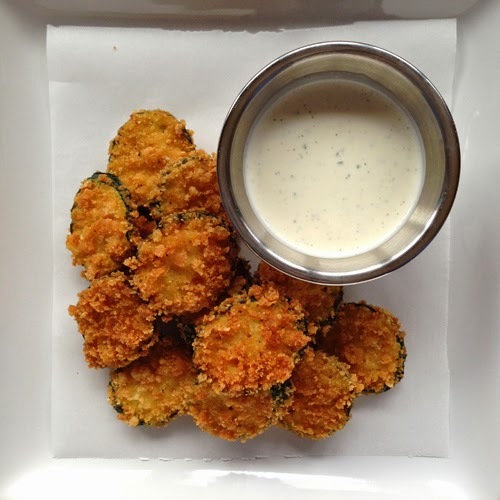 Drizzle in 1 tablespoon vegetable oil and place meatballs evenly in the pan. Cover lightly with a lid or foil. When you can see that the meat is starting to cook and brown, gently turn meatballs with a small spatula. Turn, cover, and cook until meatballs are browned and juice is starting to run out. Turn the heat down if meatballs are browning too quickly. When meatballs are pretty much cooked through, add the pizza sauce and tomato sauce. 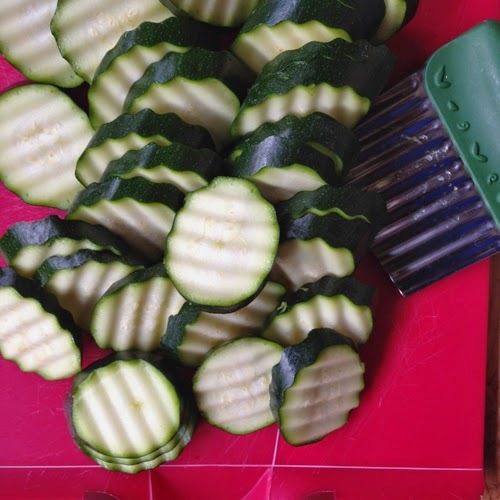 Rinse the jar and can with the 1/2 cup water and pour into pan. Gently stir meatballs and sauce. Turn heat to low and simmer for 15-20 minutes while you prepare noodles and sides. 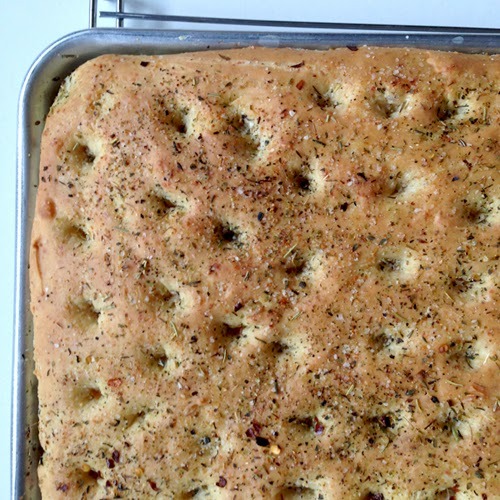 I've had this recipe for probably seven years, and I'm just now getting around to baking it. It comes from an awesome woman who used to go to our church, until she and her family moved out to the country. 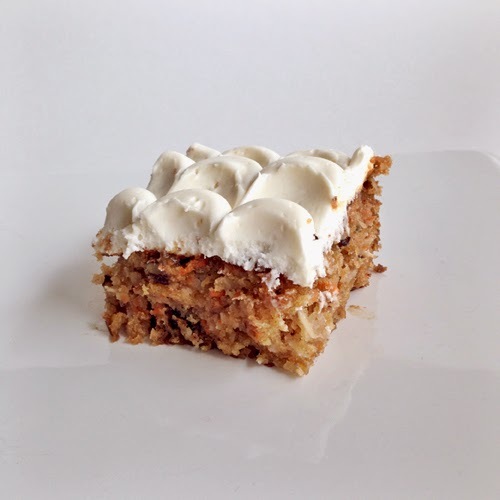 She made this for one of our church picnics, and I just remember it being the most delicious carrot cake I've ever eaten: moist, flavorful, tender, but full of texture, with a perfect cream cheese frosting. Mmmm... I really don't know what's taken me so long to bake one myself. The cake turned out as delicious as I remember. With all of the carrot, coconut, and pineapple, it's a pretty dense, moist cake. With the cream cheese frosting, it's a non-chocolate winner. Preheat oven to 350 degrees Fahrenheit. Spray a 9 x 13 inch pan with non-stick cooking spray and set aside. Cream oil, sugar and eggs. Add flour, soda, salt, and cinnamon. Mix well. Blend coconut, carrots, pineapple and nuts. Add to mixture. Pour into prepared pan. Bake for 40 minutes @ 350. 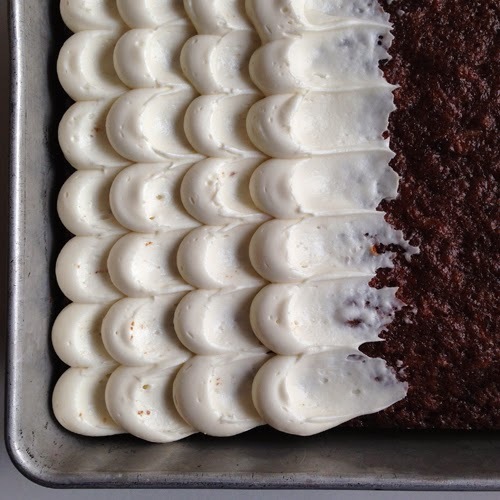 While cake cools, beat the cream cheese, butter, sugar and vanilla together until smooth and creamy. Frost cooled cake. I store mine covered in the fridge because of the cream cheese frosting, although I'm not sure how necessary refrigeration is. 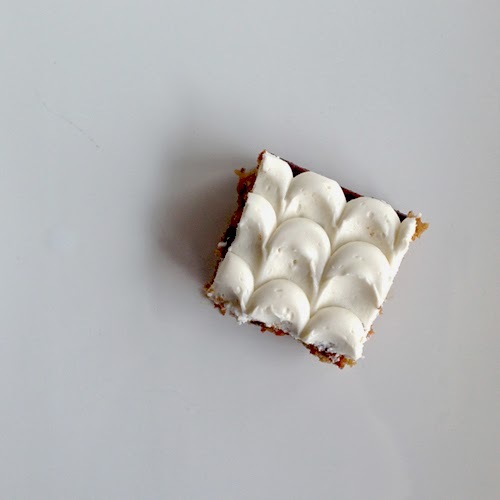 A simple pan cake made a little fancier with some attention to the frosting. I'm sick this weekend. Very sick. High fever. I wanted bread. 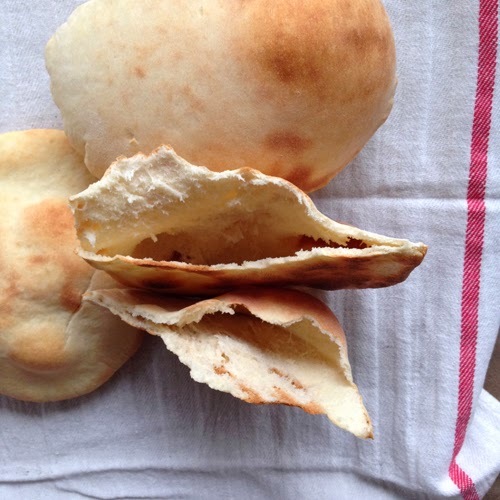 Pita bread is easy. This is it. It is delicious. Hit the spot. I used all of my energy to make it and type up the recipe. 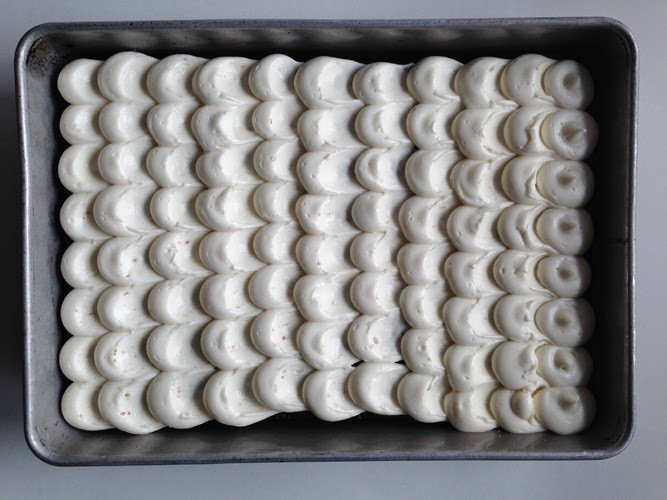 In the bowl of a stand mixer fitted with a dough hook attachment, mix all of the dry ingredents with a whisk. Add the oil and water. Mix dough on a low speed until it starts to come together into a shaggy dough. Allow the mixer to knead the dough for 5 minutes on medium to medium-high. When dough is done being kneaded, form it into a nice ball, place in the bottom of the bowl, cover with plastic wrap, and allow to rise for about 1 hour. 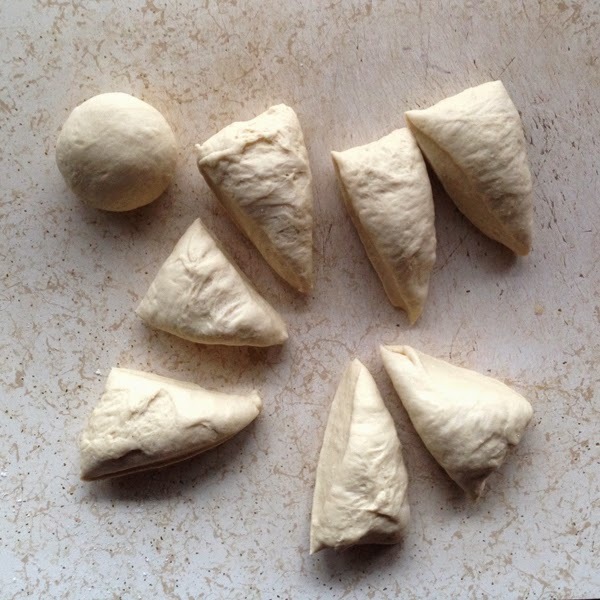 When dough has risen, turn it out onto a clean cutting board and divide into 8 equal pieces. Form each piece into a neat ball. Cover balls of dough with plastic wrap and allow to rest for about 10 minutes. Then, roll each ball out into a disk, about 6-7 inches in diameter. 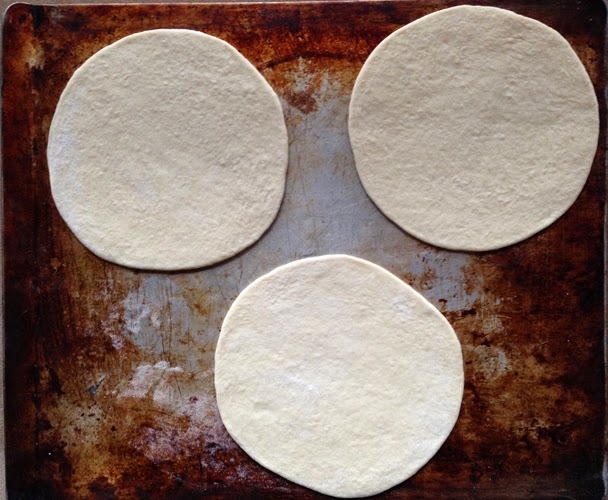 Place 3 disks onto a pizza peel (if you are going to bake pitas on a pizza stone) or a parchment-lined baking sheet. Allow disks to rest for about 11-15 minutes before baking. Slide disks onto pizza stone or place baking sheet in oven. 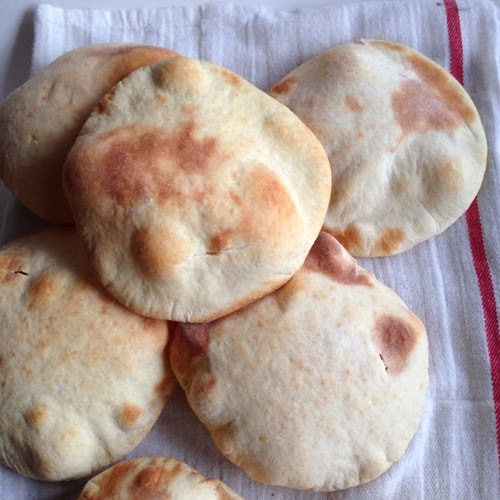 Bake for 4 minutes on pizza stone or 5 minutes on the baking sheet, until pitas are puffed and browned. Continue rolling, resting, and baking dough until all are baked.